A friend tipped me off to a great archive of magazine advertising with a collection of historical photography ads—going all the way back to the original 1888 Kodak. Of special interest is a 1901 ad for the Kodak No. 2 Brownie (see a larger version from the source). As many know (and as I’ve written about before), Kodak launched an entirely new roll size for this camera, now called 120—the same 120 film we’re still using today. The No. 2 Brownie took 2-1/4 x 3-1/4 inch photos (aka 6×9 cm). But it’s interesting that the film length was originally shorter: Only 6 shots (today’s 120 would give 8). The name “Brownie” and that scary figurine appearing on the table refer to a series of children’s illustrations drawn by Palmer Cox, very popular with children of the era. It’s not clear whether Kodak actually licensed any drawings from Cox, or merely created their own elf-like Brownie illustrations (which to be fair, had originated from Scottish folklore). 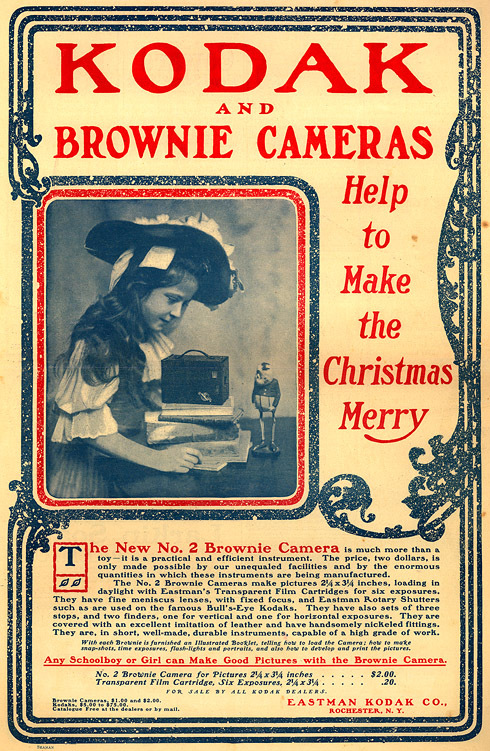 I have always wondered if the Brownie name was also a tip of the hat to Kodak’s original camera design wizard, Frank Brownell. Compared to the original Brownie, the No. 2 took larger photos and, significantly, included a viewfinder! Two, actually—allowing you to frame photos horizontally or vertically. This helped justify the doubled, $2 price tag. With this addition, the No. 2 became the template for thousands of cheap box cameras to follow—both from Kodak, and its competitors, like Ansco. Eventually the 120 size was taken up by other, top-quality cameras: First the Rolleiflex and later the Hasselblad. Both of these helped cement the reputation of 120 as a “serious camera” film. But the association between 120 and Brownies remained, enough so that in Japan, many kept referring to the size as “Brownie film.” And in 1958, this inspired a name for Zenzaburo Yoshino’s innovative new 120 camera—called the Bronica. Let’s hope 120 film survives somehow until at least the year 2021—in time to celebrate its 120th birthday. In a previous installment, I wrote about some vintage film cameras which have stood the test of time, earning the right to be called “classics.” The list included such iconic names as the Hasselblad 500C, the Rolleiflex, and the Leica M3. Yet we must note another group of long-lived film cameras. Instead of classics, let’s call them… “the holdouts.” I’m speaking of models whose success came mainly because of affordable cost, rather than any special excellence. Yet even as changing technology left them behind, some of these models enjoyed paradoxically long production runs. And a certain odd fondness for these models can persist—or even perversely increase—today decades later. The ultimate example of this group might be the Argus C3, first introduced in 1939. In the 1930s, the Leica and Contax generated a great mystique around precision 35mm rangefinders. But their prices were wildly out of reach for the average hobbyist. And then the Argus C-series appeared, offering a modest subset of the same features, in a sturdy and reasonably reliable package—yet at a dramatically lower price. A surprising influence on camera choice in those days was that Kodachrome color film was available in 135 format, but not in larger roll-film sizes. Thus, demand for some affordable, adjustable 35mm model was immense. When it was all over, C3 sales ran into the millions. In turn, popular entry-level 35′s (like those from Argus) assured a mass demand for 135-packaged film, in a way that an elite handful of Leica & Contax purchasers could not. As a native of Ann Arbor, Michigan (where Argus was founded), I should probably show more home-town loyalty for the ungainly old Brick. But let’s be honest: The C3 was never a great camera. The shutter-speed range was limited (and got smaller, not larger, in later versions); its shutter cocking arm uncoupled from the film advance was prone to error; and its separate rangefinder eyepiece inconvenient. Rangefinder alignment could be unreliable too; and switching to a different lens than the basic 50mm Cintar triplet was barely practical, requiring unwieldy disassembly. By the time World War Two ended, the C3 design was already dated, and Argus knew it. They attempted to revamp their lineup with the “Markfinder” 21, featuring a streamlined body which soon evolved into the C-4 and C-44. Despite those models’ dramatically-improved viewfinders, sales never caught up with the cheaper (and still manufactured) C3s, which stayed in production all the way until 1966. I’ve always suspected a certain psychological basis for the C3′s longevity: Its boxy, geared appearance gave gave a generation of men (probably Popular Mechanics readers) a feeling of pride at mastering what certainly appeared to be highly complex technology. In comparison, perhaps the smaller and less alarming-looking C-4 made photography look too easy. But by the end of the 1950s, the glaring discrepancies between a C3 and the many cheaper, better-featured Japanese brands only hastened the collapse of the Argus company. Another curious “holdout” is the the long-running Yashica Mat series. Germany’s Rollei has always defined the standard for twin-lens reflex cameras. But in the late 1950s, an automatic crank-advance Rolleiflex featuring a 4-element Tessar lens commanded a US list price of about $200. (That equates to about $1500 today.) 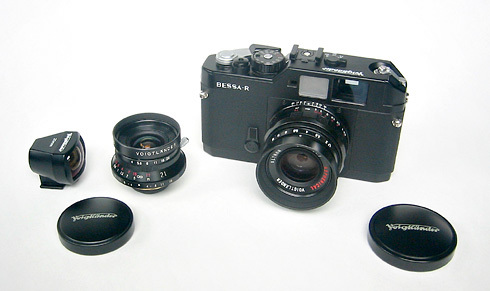 But by that time, crank winding and a Tessar-copy lens were also offered on several premium Japanese TLRs. This included Minolta and Ricoh models listing for about $100, or Kowa’s “Kalloflex” costing $120. But in 1957, Yashica (whose previous TLRs had all been inexpensive knob-wind models) matched the same feature set with its new Yashica Mat—at an aggressive price point of only $75. Sales took off, and never stopped. By the middle 1960s, it was clear that 35mm film and eye-level viewing would dominate future amateur camera sales. 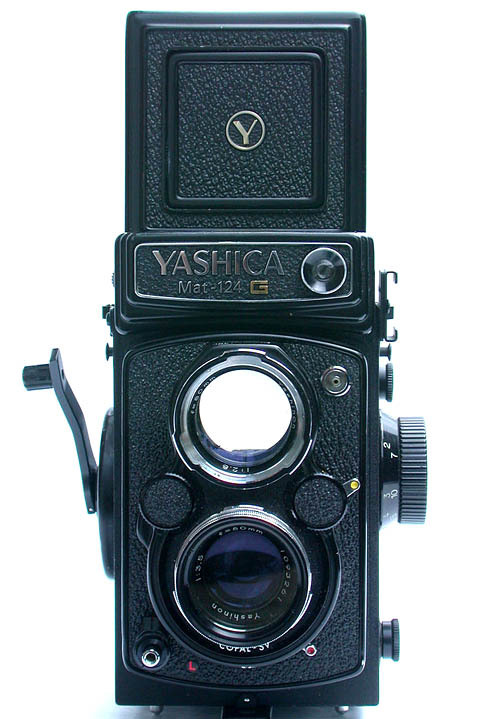 So most Japanese firms who built TLRs dropped them from their lineups—except for Yashica. 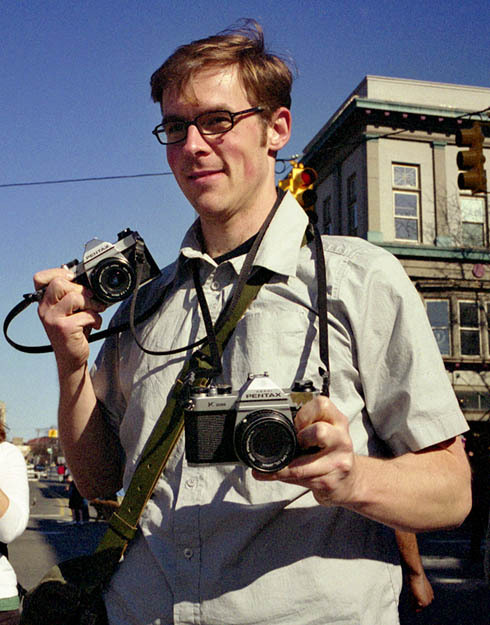 (Another exception was Mamiya, with their interchangeable-lens, pro-oriented C series.) After some early selenium-cell models, by the 1960s the ‘Mat had acquired a CdS light meter. And then—astonishingly—production marched onwards all the way to 1986, with only minor changes in the basic design. When a camera model becomes a hit (like the C3 or the Yashica Mat), its maker can spread tooling costs over more units—a simple economy of scale. This can sway a company into extending the life of a still-profitable older model. And so, a once-booming segment of Japanese camera manufacture dwindled to its final remnant in the Yashica Mat, whose optics and metering remained stuck in the 1960s. It would be hard to argue that the Yashica Mat was Japan’s finest TLR. (I might make that claim for the Minolta Autocord; and I’m sure the Ricoh and Kowa models have their partisans too.) So the enduring renown of the Yashica Mat is a bit of a puzzle—as are the inflated prices that the final 124G version sometimes fetch today. Instead, it is the sheer number sold and their workmanlike service record which earned the model its fame. 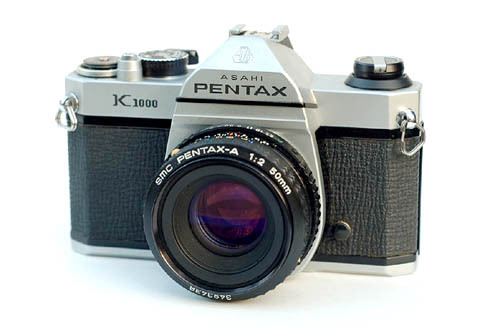 The Pentax K1000 was introduced in 1976. Blissfully ignoring industry shifts towards autofocus and microelectronics, it stayed in production until 1997. 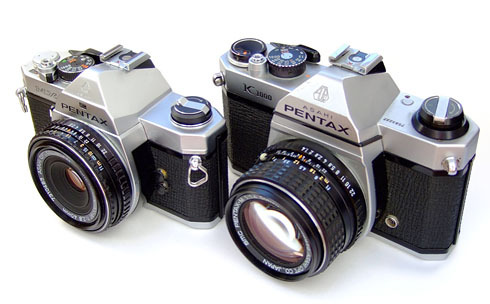 In fact, aside from its K bayonet lens mount, the camera was little altered from Pentax’s 1960s Spotmatic series. Now, in some circles, it would be heresy to say anything negative about the K1000. Its fans praise its all-mechanical reliability, design simplicity, and beginner-friendliness. But the mystery is why this fondness endures today, when other fuller-featured cameras sell for lower prices on the used market. In the mid-1970s, the appearance of the Olympus OM-1 dramatically shook up the Japanese camera industry—re-writing the rules for what camera consumers expected. Like other manufacturers, Pentax moved to redesign its SLRs, revamping their K-mount offerings with a new, compact M series. Within this lineup, the MX filled the niche of their mechanical- shutter, manual-exposure model. …and perhaps even some others I’ve missed? For all these beloved econo-cams, we must praise the positive. When new, each opened doors for aspiring photographers at an attainable price. Their spartan feature-set helped focus the beginner on learning the essentials—exposure and composition—rather than fiddling with gadgets. And all gave surprisingly reliable performance, considering their low price levels. But past a certain point, a strange feedback loop comes into play. Large sales meant widespread familiarity with particular models—and perhaps some rose-tinted nostalgia from those who got their start learning on one. Veteran photographers and photo instructors began to insist that their protegés also start with a spartan, all-manual camera, at a time when the available choices in the marketplace had dwindled down to a handful. So their production runs dragged on even further. And perhaps the former students became professionals and teachers themselves, repeating the cycle all over again. Today, no K1000′s or Yashica Mats are available new. Film shooters mostly buy from the same pool of used cameras showing up on eBay. 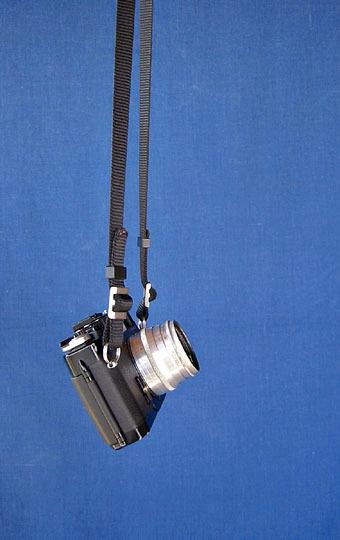 I noted in my last post that Japan’s Cosina company had spent decades manufacturing basic, entry-level SLRs—essentially the peers of the K1000—usually even featuring the same K bayonet mount. Yet they were sold under a bewildering roster of different brand names; so there’s no popular recognition of any one model. 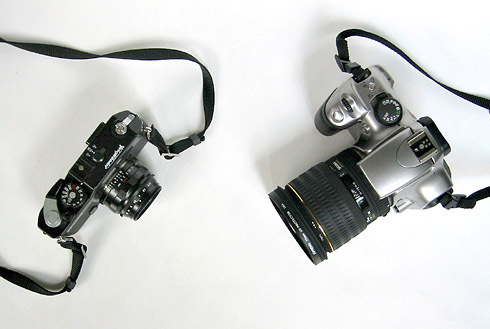 But Cosina continued to evolve its SLR platform, until even these inexpensive models featured 1/2000 sec. top shutter speeds, 1/125 sec. flash sync, sensitive silicon meter cells, and other amenities common to 1980s camera designs—but missing from the K1000. Yet I doubt any of this will sway the die-hard fans of the K1000. Remember, the (original) Volkswagen Beetle remained in production well past the point that its engine and suspension had become engineering anachronisms; in fact the bug became an iconic brand. And just as nostalgia for the old Beetle spawned a 1999 revival, cult reverence for the K1000 caused Pentax to re-brand their (previously unpronounceable) digital SLRs with new models dubbed K10D and K100D. And there’s more to camera choice than steely rationality (as any regular reader of this blog should find obvious!) So for those who find their no-frills Yashica Mats or K1000′s the right tools to unlock their creative energies—by all means enjoy them. It may be stretching a point to review the Voigtländer Bessa-R as a “vintage camera”: This model was only discontinued a few years ago, and several of its younger siblings are still in active production. Yet for a classic rangefinder lover, the appearance of this new camera in 2000 was like throwing raw meat in front of a hungry beast: The “R” of the model designation might as well stand for Retro Rangefinder Revival. For years I have happily bought and enjoyed used equipment; but the Bessa-R and its matching lenses actually caused me to open my wallet and plunk down serious cash on new-in-box photo gear for the first time in decades. Despite the umlaut-festooned name, the current Voigtländer lineup comes from Japan’s Cosina. This is a company which has been quietly cranking out cameras for many decades—but with only a tiny fraction sold under their own name. Over the past 30 years, Cosina ironed out a standardized kit of parts—including shutter, film transport and meter electronics—to build a basic, no-frills SLR. And this “platform” (as the auto industry would call it) was quickly adaptable to different lens mounts and camera styles. So, many entry-level cameras for other brands were really manufactured by Cosina, like the Nikon FM10, the Canon T60, Olympus OM2000, or any of the Vivitar SLRs. The rest of Cosina’s business is making optical glass and lens components—and interestingly, building computer LCD projectors (again, all sold under other brand names). Anyway, they’ve developed quite a lot of expertise at being the low-cost supplier of optics and opto-mechanical products without compromising quality—for example, making aspherical lens surfaces cheaply. After some wrangling, Cosina worked out the licensing to use the trademarks from the long-defunct Voigtländer company of Germany (although Cosina still doesn’t own the name outright). This licensing arrangement is why the cameras are still weirdly marked “Voigtländer Germany” on the top and “Made in Japan” on the bottom. Cosina’s first bombshell product was an ultrawide, rectilinear 15mm f/4.5 lens of excellent quality (including an accessory wide-angle viewfinder that was impressive by itself). This was something even Leica & Zeiss hadn’t attempted before; and even if they had, it would certainly have cost thousands of dollars. But Cosina priced it at under $400. 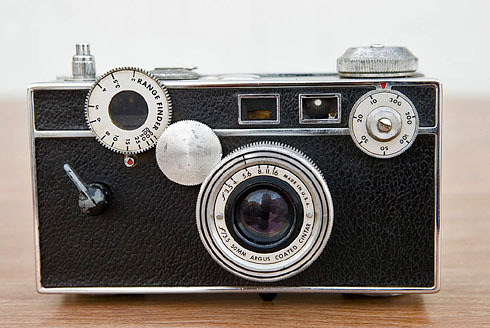 Cosina’s next body was the Bessa R, their first rangefinder model. This also shocked people, by offering an outstandingly crisp and bright viewfinder that was arguably clearer than that of many “classic” models from Leica, Contax, Canon & Nikon. The R’s film door and top and bottom panels were made of plastic, which caused some rangefinder purists to bristle, but this did allow for a lighter weight body. And Cosina kept introducing more and more interesting, top-quality lenses. One strength of lenses for rangefinders is that without an SLR’s flipping mirror in the way, a lens can recess more deeply into the body and be made much more compact. Also, because slow lens speed does not reduce viewfinder brightness, rangefinders let you opt for even svelter, moderate-aperture lenses if you prefer that. For an interchangeable-lens travel kit, a Bessa R plus a few lenses saves ounces even compared to the far-from-chubby Olympus OM system equivalents that I own. Compared to the elitist pricing of the Leica M series, Cosina simply rewrote the cost/performance equation for rangefinder lenses. They are not always cheap relative to SLR equivalents, but the build quality is always solid and nicely finished. The silky feel of the half-stop aperture detents on my 35mm f/1.7 is quite lovely. A variety of companies besides Leica have made 39mm thread-mount lenses over the years, particularly Canon (in their 1950s, pre-SLR days). These all turn up on eBay from time to time, including some cheap, idiosyncratic Russian optics originally made for the Zorki and Fed rangefinder cameras. The quality control with these is quite erratic, but you can get lucky and find an excellent one. The R and R2 bodies can be ID’d at a distance by their top plate, which slopes away diagonally from the viewfinder windows. All subsequent Bessa models have a step-down top panel design instead, and all continue the M bayonet mount and metal construction. The current bodies weigh about 10% more than my old plasticky R.
The bayonet attachment is obviously a lot less fumblesome than the thread mount for changing lenses quickly. (Threading lenses onto an M39 body goes easier if you rack their focus out to the closest distance, thus retracting the rangefinder coupling.) And the throat of the M bayonet is a little larger, allowing for wider-aperture designs. So, while the original Voigtländer lens lineup used screw mounts, the trend is for the recent Cosina introductions to be M bayonet only. (Note that you can’t go backwards and mount those on an R screwmount body.) Cosina’s new M bayonet 35mm f/1.4 looks very nifty—even lighter and more compact than my f/1.7 threaded version. But the later lens releases have been accompanied by price increases, making them less of a bargain compared with the original series. Cosina’s good work also caught the attention of Zeiss: Today there is a new Zeiss Ikon rangefinder line, manufactured by Cosina (in fact, just a re-engineered version of the Bessa series). This is intended as a showcase for Zeiss’s top-end lens designs. 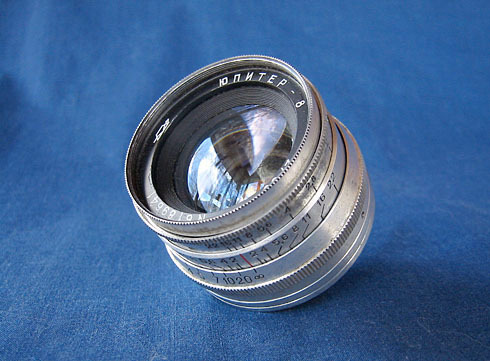 All but two of the lenses are assembled by Cosina, however. But to take a step back for a moment… There’s a more general philosophical question, about what rangefinder cameras are good for. Unlike an SLR, rangefinders allow you to maintain “eye contact” with your subject right through the moment of exposure. Also, the area visible outside the framelines can help you anticipate where unpredictably-moving subjects are headed next. So rangefinders have long been a favorite for people photos and street shooting. I find that my Bessa is the camera I grab for group events, where I expect to take shots of people wandering around interacting with each other. Compared to the shallow depth of field of an SLR groundglass, the RF viewfinder sharply renders all of the potentially distracting clutter within the frame. You might find this makes you more conscious of when you need to move around to get a clearer viewpoint. On the minus side, rangefinders aren’t the best choice for exact, tight framing. Most rangefinders stop focusing at about 3 feet from the camera. Different brands have more or less accurate framelines, but you generally get a bit more coverage on the film than what the viewfinder showed. That’s fine if you don’t mind “casual” framing, or plan to crop anyway—but I’m a no-cropping purist, and this aspect sometimes bugs me. An RF viewfinder does not change its angle of view when you switch lenses; with the Bessas you need to flip a lever to switch in different-sized framelines matching each focal length. But this means that for a particular viewfinder, there is only one frame size that makes the maximum use of the visible area. Switch to a wider lens choice, and you’ll need an auxiliary viewfinder (slid into the camera’s hot shoe). Go to longer focal lengths, and you’ll be framing your subject in successively smaller rectangles within the middle of the image. Thus, on my Bessa R the 35mm frame is great to use; but the one for a 90mm lens is really somewhat marginal. You get used to all this quickly enough—but it’s not quite the seamless experience of swapping lenses on an SLR. And manufacturing an interchangeable lens mount with rangefinder coupling adds a lot to the complexity and cost of the camera. So if you always plan on using just one focal length, you might consider that there have been many delightful fixed-lens rangefinders made over the years—often quite a bit more compact than the Bessa line, and with leaf shutters bordering on the inaudible. I have long pined to own a 1970s Yashica Electro GX—nice and compact, with a fixed 40mm f/1.7 lens and aperture-priority auto. But they’re maddeningly difficult to find in North America, although apparently less so in Japan. Anyway, today’s current Bessa lineup has become rather confusing, with autoexposure and manual versions of three different viewfinder variations. Two remarkable new models are the R4A and R4M—unfortunately the most expensive ones—whose viewfinder shows the view of wide-angle lenses up to 21mm without a need for auxiliary viewfinders. 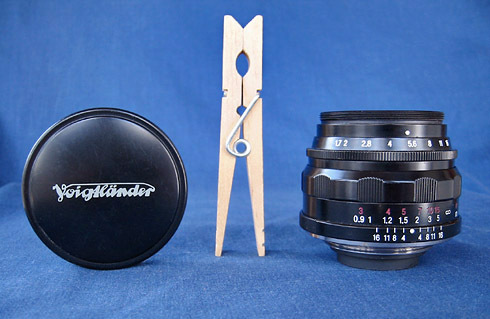 All the Voigtländer “A” models offer both manual metering and aperture-priority autoexposure—although their electronic shutters mean they’re dead without batteries. I have not personally touched any of the auto versions, but the description/diagram of the viewfinder display makes it sound slightly distracting to me. • Because they’re based on a retooled full-sized chassis, their height and width is really no smaller than a typical film SLR. It’s only in their front-to-back body+lens depth where they have a significant advantage. • The strap lugs on the R are on the front of the body—unmoved from their original SLR position. • With the subjects I shoot, I definitely hit the RF close-focus limit more frequently than I’d like. • Most worrying, the film transport derived from their old platform just doesn’t quite have the reliability that you’d expect in a $500 camera. About once every second or third roll, my R has a brief frame-spacing hiccup (though this appears to be getting better, not worse, with wear). And I’ve heard a number of stories of people experiencing total jam-ups. On the other hand, I’ve also heard of people “fixing” the problem by sharply thwacking their Bessa against the heel of their hand (if you try this, I’m not responsible). Now against all of that, I must end by mentioning the positives: A Bessa is just about the handsomest camera around (especially in black). The viewfinder is simply a delight. (A DSLR-using acquaintance once literally gasped when she looked through it—this fueled at least two full months’ worth of smugness on my part.) And the wonderful Ultron 35/1.7 is on my short list of lenses to grab whilst running from my burning home. Plus, a camera that flies so completely in the face of today’s camera mainstream is a proud, defiant badge of eccentricity—one I am happy to wear.